Peace talks, economic investment and trade to highlight meeting between Abbas and Russian president in the Kremlin. Russian President Vladimir Putin will meet Palestinian Authority (PA) Chairman Mahmoud Abbas in Moscow on Monday where the issue of Middle East peace talks will be raised, Russian authorities announced Thursday. "The two leaders will hold talks concerning key aspects of Russian-Palestinian relations and their future, with particular attention on the trade, economy and humanitarian sectors," the Kremlin said in a statement according to AFP. There will also be "an exchange of ideas on the process of Israeli-Palestinian talks and other problematic regional situations," the statement continued, adding that North Africa would also be on the agenda. Abbas is also scheduled to meet with Russian Prime Minister Dmitry Medvedev on Monday to discuss economic and investment issues. PA "ambassador" to Moscow Fayed Mustafa said Abbas would sign several intergovernmental accords during his three-day visit to Russia. Russia has often provided support for the PA in the past, signing a massive $1 billion natural gas project in Gaza with the PA last January during a similar visit by Abbas. 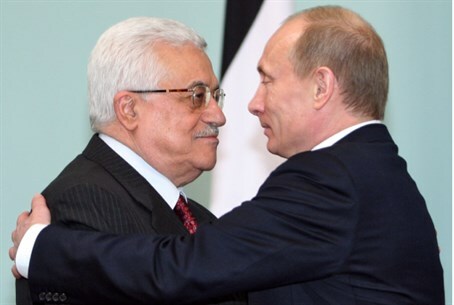 During that same visit, Abbas urged Putin to play a greater role in the peace talks with Israel. That request came mere months before the PA torpedoed ongoing talks by unilaterally signing international accords and sealing a unity deal with Hamas. Just last October, Russia announced its support of the PA's UN bid trying to force Israel into a 2017 timeline in which to withdraw from Judea and Samaria. The bid was shot down in a vote. Ties between the Palestinian Liberation Organization (PLO) terrorist group and the Soviet Union began in 1970, when PLO founder and arch-terrorist Yasser Arafat visited Moscow. In 1988 the Soviet Union officially recognized "Palestine" as a state, following a proclamation at the Palestine National Council in Algeria that year.